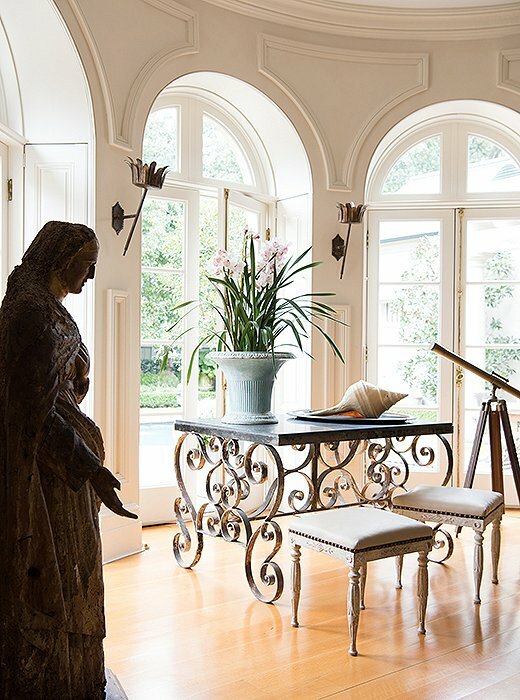 Tara stood a statue from Avignon (“probably 16th century—it’s worm-eaten and petrified in the back,” she says) by the living room windows, which look out on a saltwater pool. Eighty trees line the property’s perimeter, giving it a sense of privacy. 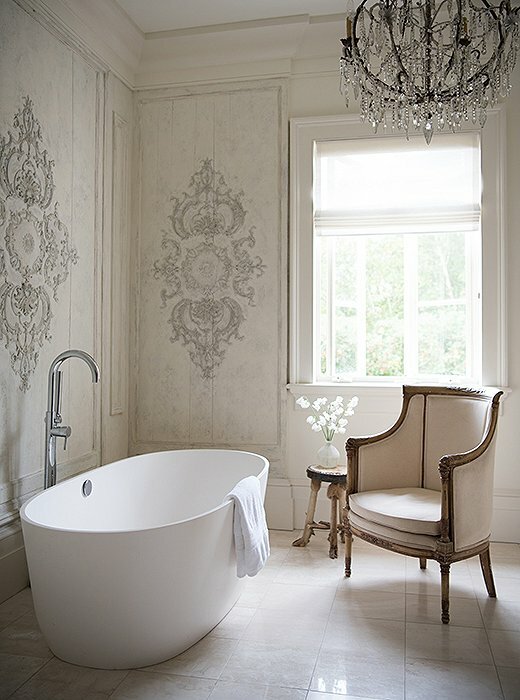 Take in this breathtaking New Orleans home, where Tara lives with her husband and their beloved whippet, and pick up the designer’s well-honed tips on how to live with antiques. 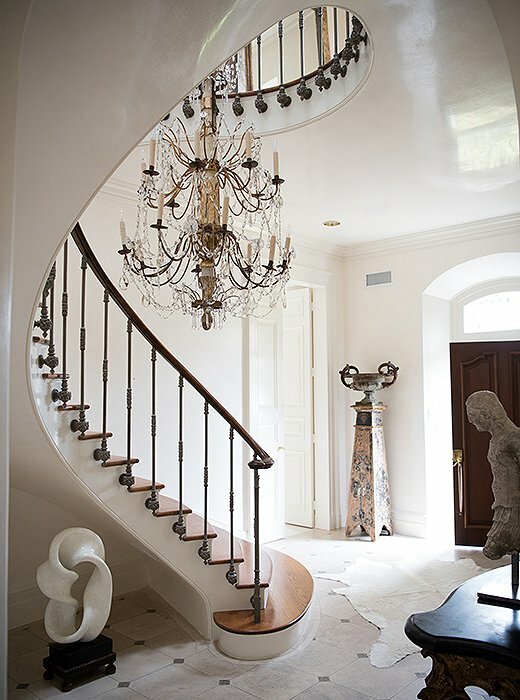 Tara wanted to balance the house’s austere facade with a comfortable, light feeling inside. 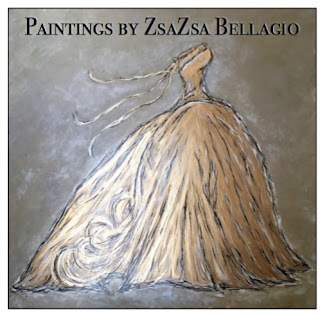 For the foyer, she chose Venetian plaster for the walls. It’s glossy, textured, and easily repairable—important for such a high-traffic space. 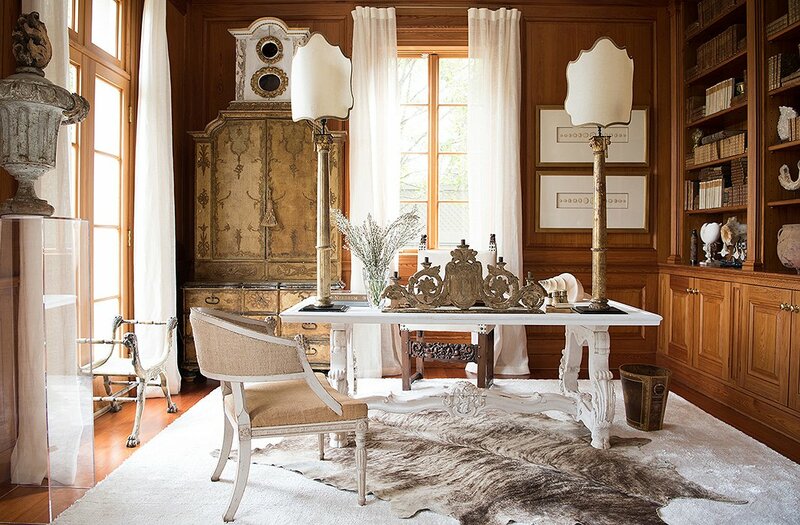 With Italian Corinthian fragments (made into desk lamps) and a reliquary standing atop a secretary, Tara’s office hits a high note of European grandeur—as she puts it, “When you walk into the room, you see this beautiful Old World visual.” She saves it from feeling heavy by sprinkling in neutrals. 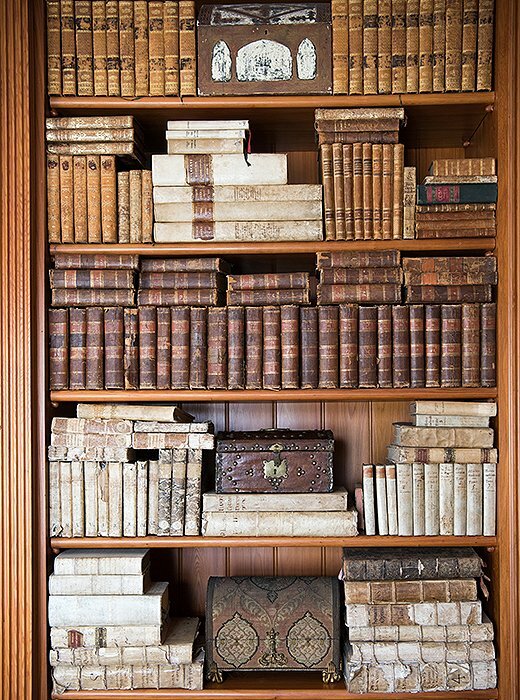 Opposite this Old World visual are the 21st-century technologies that make the office tick. 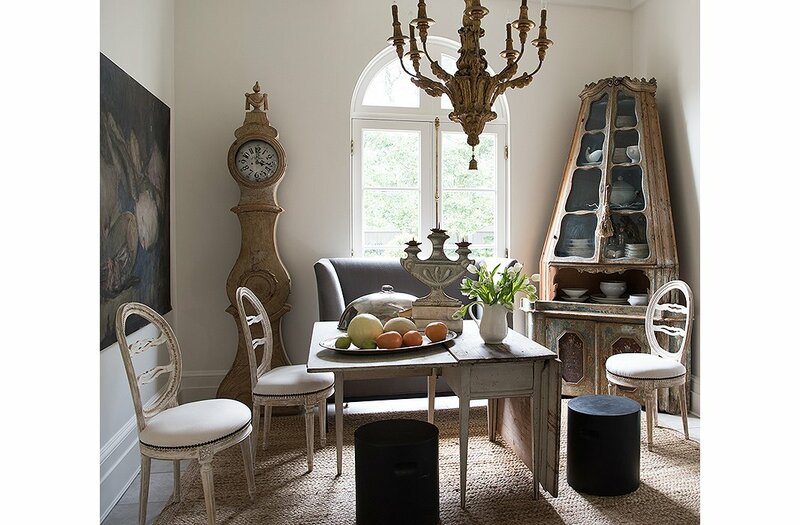 An 18th-century Venetian corner cabinet, a 19th-century Belgian still life, and a Swedish drop-leaf table make the breakfast room feel as if it’s been lifted out of an earlier century—yet Tara has balanced the pieces with dining room chairs and a gray banquette from Tara Shaw Maison. 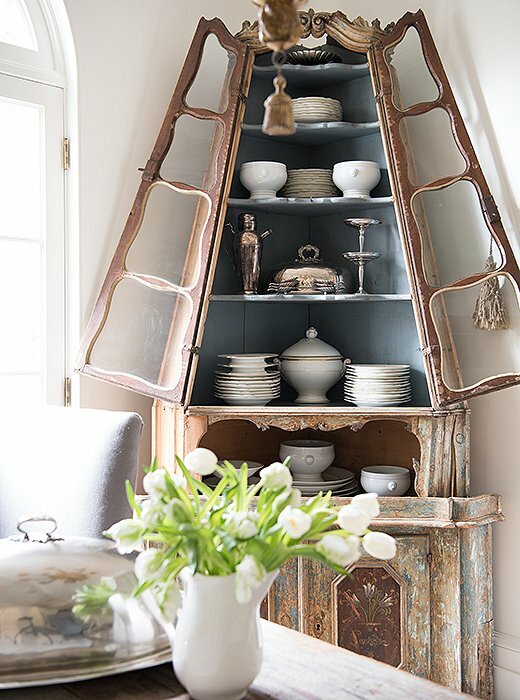 Tara’s collection of white French antique plates pops against the light-blue interior of the antique corner cabinet. 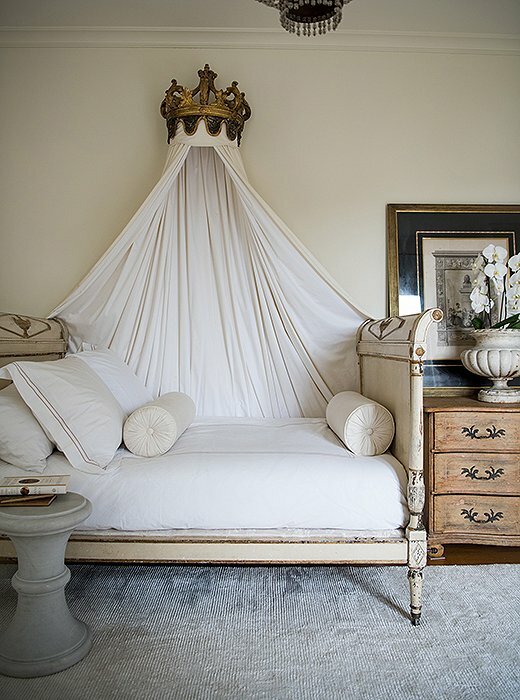 “When I painted this room, I’d fallen in love with Benjamin Moore’s Linen White, and I loved how that looked with the white resin sculpture,” Tara says of the master bedroom’s sitting area. 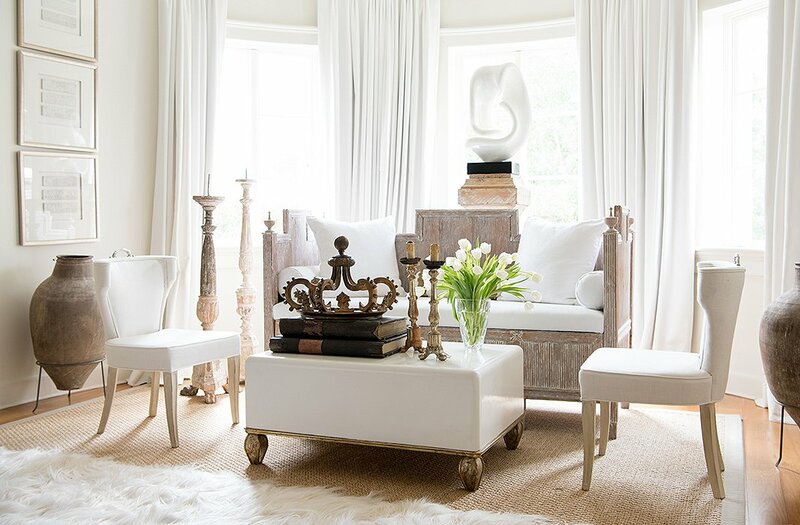 Tara layered more white from there: drapes, a 22-ounce linen on the banquette, more Linen White in a high gloss on the coffee table. 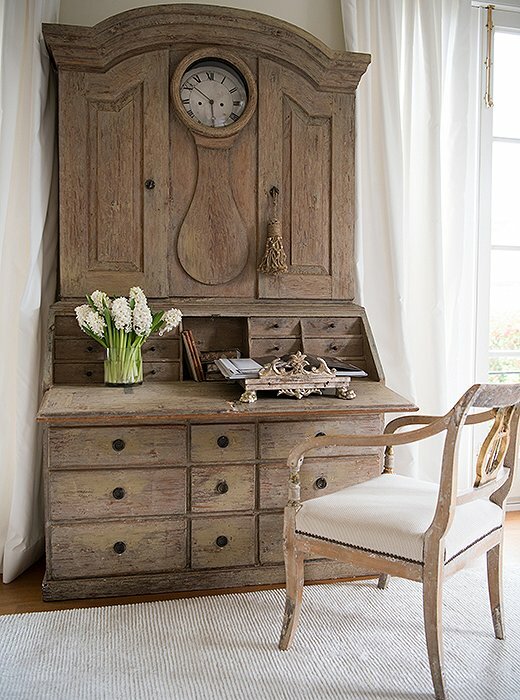 The trunk at the foot of the master bed is another treasure from Italy: Covered in velvet and nail heads, with its original toile, it provides lots of storage. “I can open that trunk and there goes everything I want to hide.” The cozy long-haired rug is balanced by the high-gloss car lacquer of the bed frame. 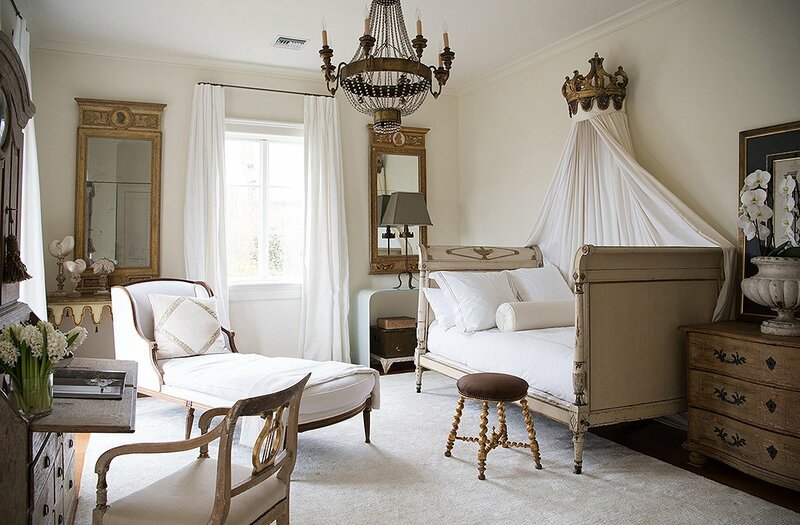 Modern-leaning, streamlined table lamps flanking the four-poster bed perfectly balance an ornate antique mirror. 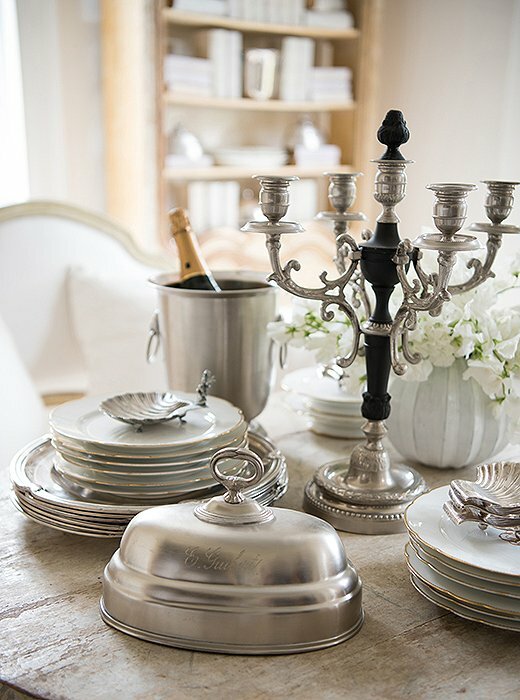 While the lamps match, Tara used mismatched bedside tables and wall decor on either side. 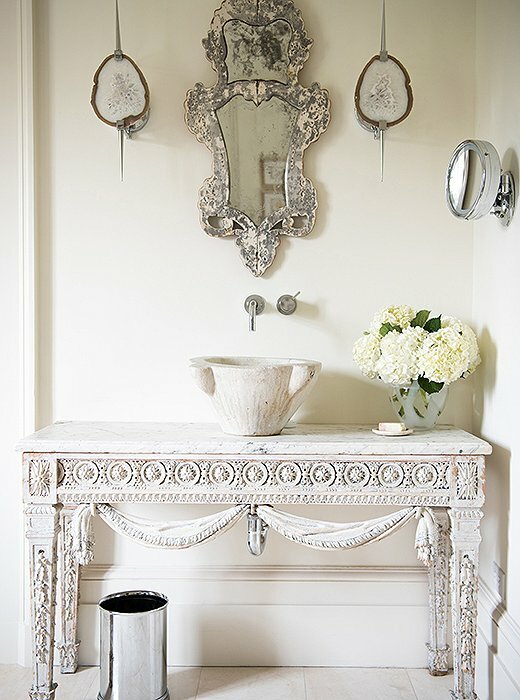 Tara created a bathroom sink to her taste by converting an Italian mortar to a sink and installing it in a white vanity table. 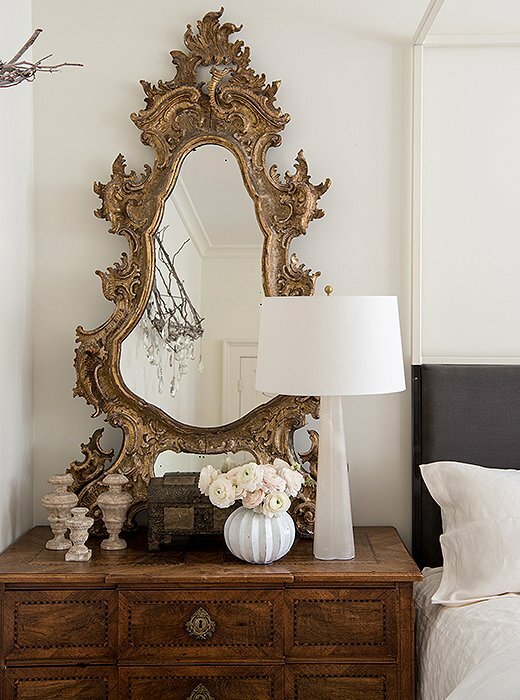 A Venetian mirror hangs above it. 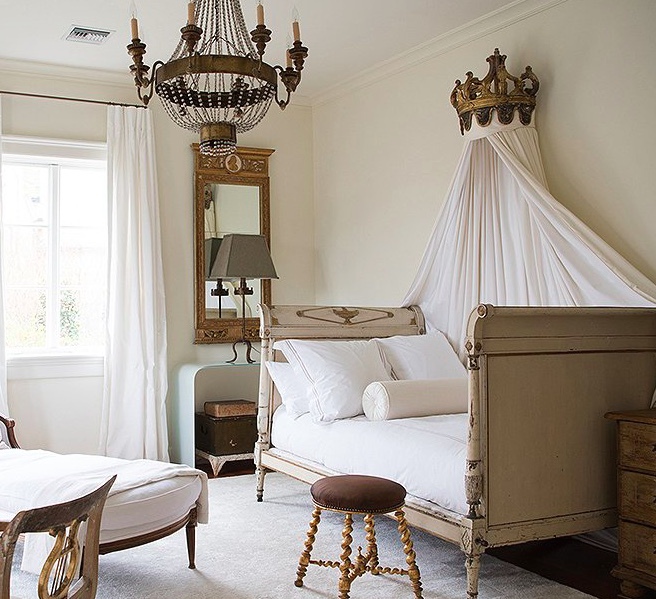 The guest room seems redolent of a French château, yet if you look closely, Tara has balanced the haute French design—the Directoire bed, the 19th-century chaise—with refreshing contemporary pieces like an opaque glass console. 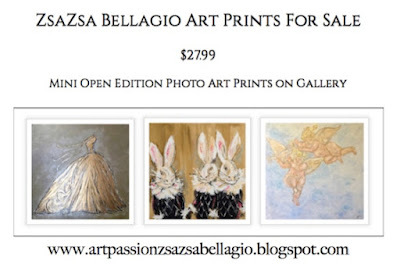 This entry was posted in antiques, Home & Design, House beautiful, latest. Bookmark the permalink.